Jamie is your typical twentysomething, currently looking for his place in the world in the vastly-beautiful city of Brisbane, Australia. He works as a concierge at a local gentlemen’s club after coming to terms with what other arts and philosophy majors have unfortunately realized in that their degrees have ultimately failed them. He lives in a rooming house with a bunch of bachelors who party, deal drugs, and treat him like a red-headed stepchild. He does have red hair but he doesn’t deserve to be treated this way because of his passivity and unflinching personality. On his way home after work his trusty Nissan breaks down, and in a pre-cell phone era he is forced to push it home or risk having it stripped. In the corner of his eye he encounters what looks like an intoxicated clown traversing atop a building. While initially concerned, he becomes intrigued as he notices a brother in matching face paint and red nose appear, and as soon as Jamie can say “o-waw-o-waw-o-waw-o bop beep” both of the clowns vanish. Scouring the scene wondering if what he saw really happened or if he is going crazy, he finds a bag which looks like it contains the substance that caused the craziness that he just witnessed. He takes it home as a means to get in the good graces of his chemically crazed roommates. The next morning Jamie is in a rush to work without a proper shower (because it was occupied) or a breakfast (because his roommate Steve ate his food); in retaliation Jamie slips some of the unidentified powder into Steve’s morning coffee to help give him an added boost. When Jamie comes home he can smell something rotten and walking through the doorway he can see feces smeared all over the walls, garbage strewn over the floors, and graffiti in every room; he starts to wonder what in the Sam hell he gave Steve. What Jamie didn’t see coming is that he may have inadvertently earned his big break? 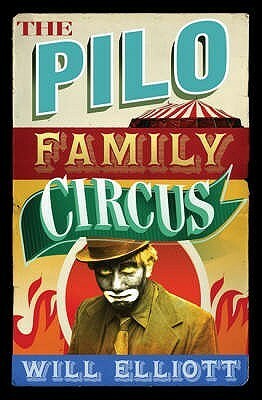 Like all good circuses or carnivals, The Pilo Family Circus does what it can to ensure the audience has an unforgettable time, while selfishly enjoying their time on stage. With Ferris wheels, fortune tellers, carni games, acrobats, fried foods, magicians, a freak show, mirror mazes and most importantly, the defining figure, the clowns. Unlike The Ringling Brothers or Barnum and Bailey the The Pilo family Circus is orchestrated by two brothers that routinely attempt to kill each other every chance they get and by any means necessary. The circus has been around for over five hundred years and even if Kurt and George Pilo were to die, the deal with the devil that their father made would ensure its continuance for many more hundreds of years. This circus was a tumour in the world that could not be diagnosed. Acrobats are poetry in motion, appealing to the audiences’ inherent feeling of vanity, their desire for beauty, while broadening the effects of the worst of the seven deadly sins through their illustrious act. Clowns play with the audiences’ buried love for violence, rebellion against authority figures, and cruelty to others for their own amusement. A magician thrives on the hunger people have for power, the insatiable appetite that people have for control over people, places, or things. Through literary conveyance and illusions, the magician always gets their way. Let’s take a closer look at the clowns. A clown’s job is filled with either ‘good job’s’ or ‘whoopsies’. Jamie is having a difficult time adjusting to life in the circus despite his red hair. Nicer the man, meaner the clown. That was typically the way history depicted a future course of action. After an appointment with the skewed and dishonourable fortune teller Shalice, he realizes that he was gifted a life in the circus to spare him from the monotony and cumbersome nature of the real world. His new mornings consisted of feelings of terror, doom, and helplessness along with the physical distresses of nausea, vertigo, and such an intense stomach pain that it felt like his kidneys were playing ping-pong with his gall bladder. The term family gets thrown around quite loosely in the business world and in this case it’s no different. Hypocritically, the Pilo Family Circus thrives on internal competition to bring out the best in each act. If you look further you see that each unit is pitted against each other, which isn’t bad but if it leads to sabotages, violence, performers in the “stew”, deaths, or worse a trip to the master manipulator I would argue that it is a tad counterproductive. This book is a funny, sadistic, out-of-this-world, horrifying look at life in The Pilo Family Circus. With television shows like Carnivale and American Horror Story, The Pilo Family Circus highlight the reasons why people love the circus and in the same breath fear the goings on after the show is over. This book lived up to my expectations, which in this case is a good thing and would recommend it to readers that are interested in the macabre. Thoughts can be Deadly, Words can be Weapons, We Hold the Answer.